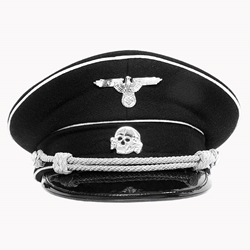 Our German WWII SS Visor Cap Reproduction is a fine quality reproduction visor cap that is perfect for the re-enactor or collector. This SS Death Head Visor Cap is black in color, complete with white piping, silver colored eagle and silver colored death head. Patent leather visor and leather sweat band. Marked in German sizes. Corresponding US hat sizes listed below. Sizes: 56 (US size 7), 57 (US size 7-1/8), 58 (US size 7-1/4), 59 (US size 7-3/8), 60 (US size 7-1/2), 61 (US size 7 5/8), 62 (US size 7-3/4). Size 56 currently out of stock. Beyond satisfied! Looks & feels like the real deal & you can't beat the price. The Adler & Death's Head are placed perfectly & made of good material. Thanks By The Sword, I have the coolest costume at the party this year.